If you looked at my iPod “RUN” playlist, you would see this band ranks 2nd in the most tracks included after Slipknot. Funny — I learned of this band via Slipknot earlier this year. They were the openers at a show I went to. The line was so long that I never got inside early enough to see them play. Everyone I talked to inside said “I missed it”. Crap! I will return. I hadn’t been to the Gothic Theater before. Figured it would be similar to the Ogden or Bluebird and it was. I swear the same dude built all three of them. This one seemed on the smaller side width wise but maybe deeper up top. Anyway, I got there and parked feet from the entrance — extra bonus over Colfax joints! Got inside and saw 3 bands play before Trivium came on. 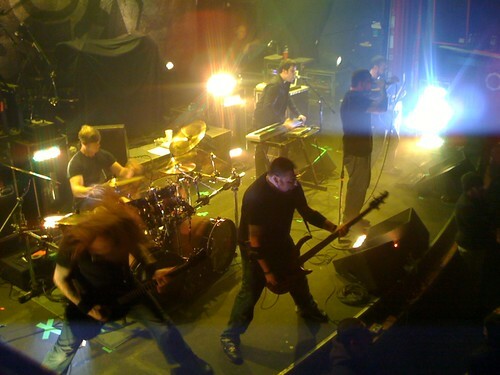 I had only heard of one before — Chimaira — I had seen them open for Disturbed at a show a few months ago. I didn’t get too pumped up over any of these guys. Lots of deep screams — do we have a name for this genre because its like a new breed of metal? Trivium does it too — but not constantly. That’s what I like. I was hanging on the floor and a big pit opened up and some shaved head dudes were pushing hard. 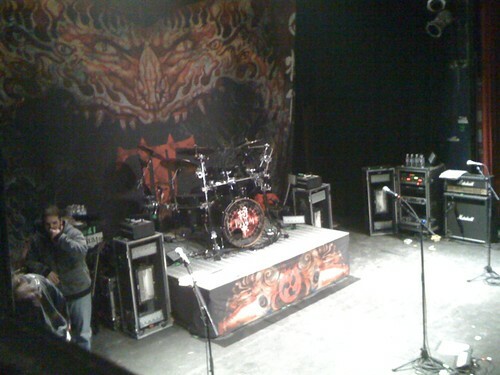 I wasn’t that into it and my eyes gazed up to the balcony on the side of the stage where a single bar stool remained. Other groups took the ones nearby but they had one extra — and I am solo. Perfect fit! I ran up there and took the seat. Just off stage right up high. Love it! The downside of the location — right in front of a speaker. I popped in my plugs otherwise I knew I would be ringing tomorrow. The stage was set and the crowd started chanting then the lights went down and the band showed up. It is fun seeing any band like this in a small club because you can actually here people yelling at the band — and they hear you! They played a great set. I had heard all the songs but didn’t know all the songs. Could have used more new stuff but oh well. Matt was really cool and didn’t disappoint. I am a fan for bands that talk to you between songs. Extra bonus — free download of the show available within a week with a code they passed out. THAT should be a concert law. INTO THE MOUTH OF HELL WE MARCH!